NLT Study Bible book review. It has been one week since I received my New Living Translation Study Bible from the NLT Bible Giveaway, and I want thank Tyndale and the NLT Blog for the free NLT Study Bible. Before I get into the meat of this post, I want to repent of my earlier prejudice against the New Living Translation. Perhaps a short confession is in order. To say that I had a bad first impression of the NLT is an understatement. My first encounter with the NLT was not in a bookstore, or a review, or an online version, or even in church, my first experience with the NLT was at a friend's house. "BUT IF YOUR ENEMY IS HUNGRY, FEED HIM, AND IF HE IS THIRSTY, GIVE HIM A DRINK; FOR IN SO DOING YOU WILL HEAP BURNING COALS ON HIS HEAD." (NASB). "If your enemies are hungry, feed them. If they are thirsty, give them something to drink, and they will be ashamed of what they have done to you." (NLT 1996). Rather than recognize that the translation was simply different, I was completely distracted, thinking I had the wrong verse. I was flummoxed. I spent the next 30 minutes looking through this unfamiliar Bible for a verse I knew was there somewhere. Alas, the ministry opportunity was lost, I was upset, and I blamed the NLT. Close enough. I assume this revision occurred in the 2004 second edition (NLTse), but I'm not absolutely positive about that. Back to my review, such as it is. Well, not really a review, per se, but my thoughts. I was pleasantly surprised to receive a black, bonded leather NLTSB which, according to the NLT Study Bible site wasn't due to be available until September 8 (the day I received it). So, a big thumbs up for the softcover. I am probably not the best person to comment on Bible extras because I read thinlines primarily, I pull out the big guns when necessary, but I prefer to read small, text-only (or text-and-little-else) Bibles. The NLTSB is certainly not that, but as far as study Bibles go, it is quite remarkable. I very much appreciate the thorough treatment of the Hebrew in the study notes, the in-depth people profiles, and the multi-faceted timelines. Admittedly, I have only been reading this Bible for a week, but from what I have been able to glean, there appear to be few, if any, doctrinally interpretive study notes apart from an overall Christian perspective. In other words, it is not apparent from the study notes that the scholars or editors are denominationally or theologically aligned - although I recognize that such an observation might, in itself, suggest something theologically. The introductory material to the books of the Bible and Old and New Testaments is well written and forthcoming with possible alternatives. Where a particular authorship or historical fact might be in question, the positions taken are well defended. Even though this is a study Bible, the language of the extra-textual writings and notes is highly readable and understandable, appropriate for teenagers and above. Lastly, and perhaps most importantly, I want to congratulate the editors for the inclusion of two, yes two, bookmarking ribbons. I think this was a stroke of genius. Now that I have a Bible with multiple ribbons, however, I would suggest the appropriate number should be three. This is not a criticism of the NLTSB, quite the contrary (I feel spoiled by the two), but three would seem ideal. I personally am not a fan of Bible reading plans, but most suggest Old and New Testament daily readings (ribbons 1 and 2), and most readers I know read both anyway, but that leaves the reader without a ribbon for his or her own personal reading. So, if I could construct the ideal Bible, it would have three bookmarking ribbons. The primary criticism, if you can call it that, of the NLTSB is not with the study aspect, but rather with the translation. I still have a repentant heart, and now that I have had time with the NLT, I am growing to appreciate the translation. I understand the need to render the text into "modern English." On the other hand, the NLT translators rendered the message more dynamically when the literal rendering was hard to understand, was misleading, or yielded archaic or foreign wording. Sound the alarm in Jerusalem! Raise the battle cry on my holy mountain! Let everyone tremble in fear because the day of the LORD is upon us. (NLTSB/NLTse). Blow a trumpet in Zion, And sound an alarm on My holy mountain! Let all the inhabitants of the land tremble, For the day of the LORD is coming; Surely it is near... (NASB). I do not mean to nit pick here, but "Blow a trumpet in Zion," is accurate ("shofar" is more exact than "trumpet," but close enough), it seems clear and quite natural. In any event, I don't think it can be fairly said that the NLT's translation is more clear or natural. This would appear to be the perfect place for the translation to be accurate and a study note applied to offer any explanation the editors saw fit. This is not the only example, but it is representative. This is a matter of personal preference, though, and I recognize this completely. On the whole, I have found the NLT to be extremely readable, and I continue to find my initial distaste melting away. In fact, I have encouraged my wife to read the NLT to see if she finds the language to her liking as I have. (Update 2016: the NLT has become my wife's primary reading Bible. In fact, she reads it almost exclusively now and has for about five years). I do not foresee the New Living Translation replacing my NASB as my primary reading and study Bible, but I would encourage anyone to experience how pleasantly it reads. I can easily see reading the Psalms, Proverbs, and Song of Solomon out of the NLT regularly. I haven't yet, but I also want to study the treatment of Revelation and Daniel in the NLT. Apart from the study-Bible aspect, the NLT is a phenomenal reading Bible. With the study Bible additions, NLT readers may no longer need to supplement reading the NLT with a more literal translation. I fully anticipate the NLTSB will be a huge hit. The popularity of the NLT has exploded, and the primary knock on the NLT has been that it sacrifices accuracy for readabilty. I think critics may find this problem resolved in the study notes. 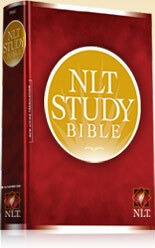 With the NLT Study Bible you get free access to the NLT Study Bible online, a nice perk. If you're not convinced just yet, no worries, you can try out the NLT Study Bible online free for 30 days here.